A true, pure medium-staining red. Drop Naples Yellow into Quinacridone Red and create a peach, or paint dry brushstrokes onto apples. Highly durable and extremely transparent, all the Quinacridone colours excel in vivid clarity and intensity. 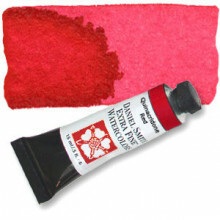 Click the button below to add the Quinacridone Red Series 2, 15ml Tube Daniel Smith Extra Fine Watercolour to your wish list.